It is a common knowledge that success is impossible without a well-designed training plan. However, there is big difference between a generic, off the shelf plan and a plan that is professionally designed and optimized to individual goals and abilities. Optimization can be achieved by using well-researched and clearly defined (formalized) parameters. Today, Super Sport Systems is the only open platform based on optimization model available on the market. This model is based on ergometric approach combined with well-researched physiological responses on “standard exercises” and strategies (i.e. – Parametric Strategies). Since our methods are based on studies of energy production mechanisms behavior under certain condition, we use Training Zones (“Energy Zones”) as our main optimization criteria. 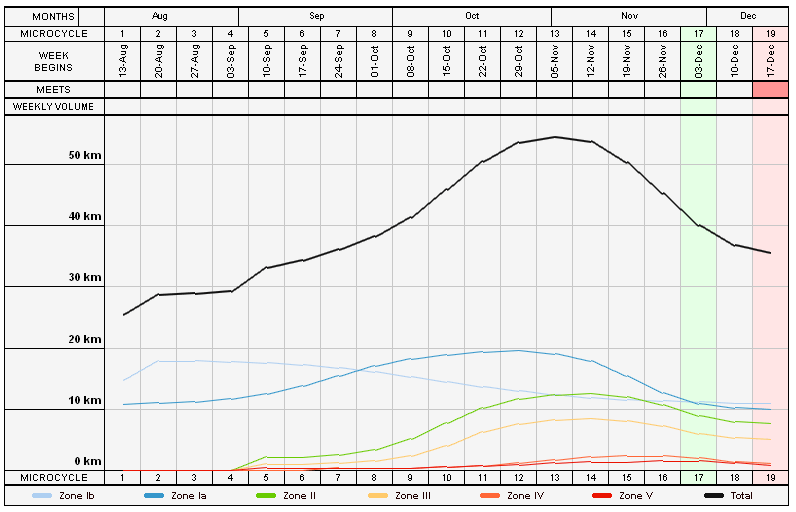 We then carefully plan each Energy Zone load progression throughout the season in relation to result in target event. The amount (Volume) and sequence of placing efforts in different zones in time (weeks and then in days) constitutes the selected strategy of preparation, which is again, dictated by level of development of desired performance components. Our Advanced Season Design Tool is the most advanced and capable tool in the industry, allowing to build and apply any imaginable season construction for any endurance sport or event. You do not have to be an expert to use Training Design Tool, the platform is intelligently suggests the most effective strategy every time you create an account and enter your goals into a system.